As the sun sets on what has been a beautifully hot summer, you may be finding yourself unprepared for the sudden change in temperature. With this in mind, we’ve put together a guide to the extra warming layers we have coming in for the new season. Perfect for if you're still waiting for the boss to put the heating on! If you’re looking to retain as much heat as possible it’s a good idea to invest in some warm handle shirts. These shirts are so called for their extra thickness to a conventional weave. In the days before central heating, warm handle shirts were a much sought after commodity! The texture and superior warming effect is achieved during the creation of the fabric. The cotton is brushed on the face side to remove any lint and fibres. The process leaves a soft texture that is excellent for trapping heat but also retains the breathability of cotton. Brushed cotton, or peached cotton, has a soft feel that creates a luxurious finish to patterned shirts and casual shirts. With the added warming benefit, these warm handle shirts are very popular during the winter months. 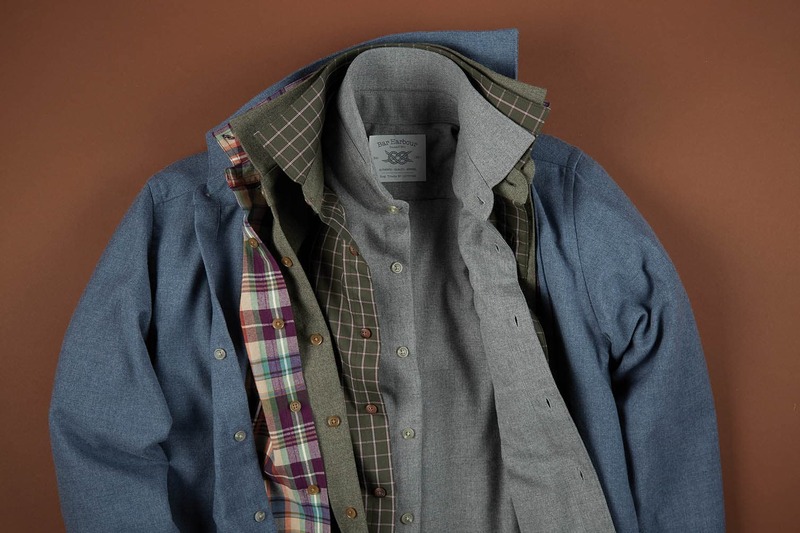 Warm handle shirts are also great for outdoors, often the go-to shirt choice of the country gent, the brushed cotton shirt is sometime referred to as a ‘country shirt’. Of all the terms however it is the description of ‘peached cotton’ that is the most intriguing. Quite simply, this is a name derived from observing the look of the material after the brushing process. When looked at through the lens of a microscope, the brushed cotton material will appear to have a small layer of fuzz on the top, just like the outside of a peach. Because the end result has both the look and feel of a soft peach like texture, the term ‘peached cotton shirts’ soon stuck. Our range of warm handle shirts encompasses both our patterned formal shirts collection and those under our casual brand, Bar Harbour. So you can look the part, and stay warm in the office or out and about for the weekend. 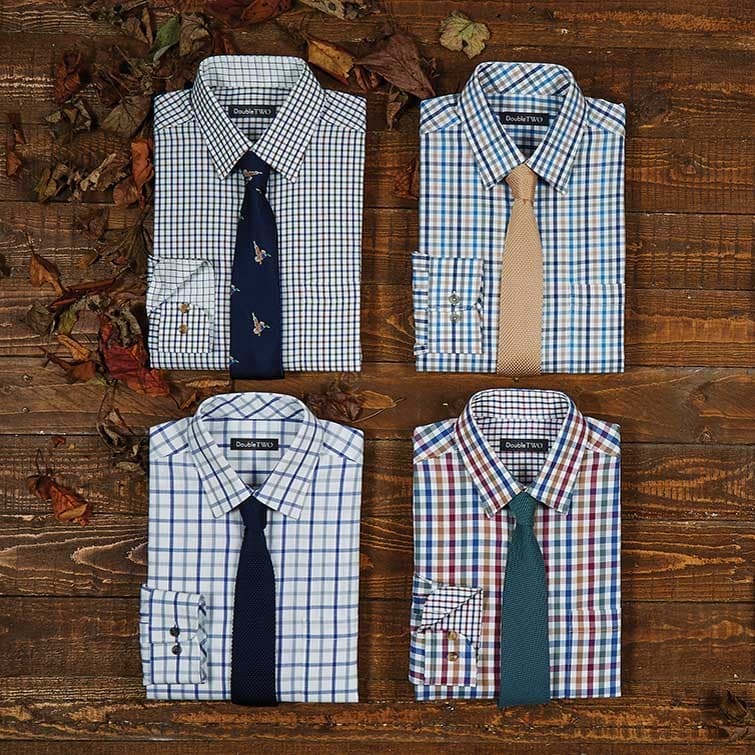 Featuring stunning tattershall checked shirts and rustic autumn hues, there’s a brushed cotton shirt for every eventuality. Classic knitwear that complements a good shirt is hard to come by. Our classic knitwear collection of v neck sweaters combines the finest cotton with luxurious merino wool. We’ve been to the ends of the Earth and back to ensure our knitwear is designed for both comfort and the height of style. And, as we’ve always known at Double TWO, the most fashionable man can be large, tall, short or small, so our collection goes from a size medium all the way up to a 5XL. 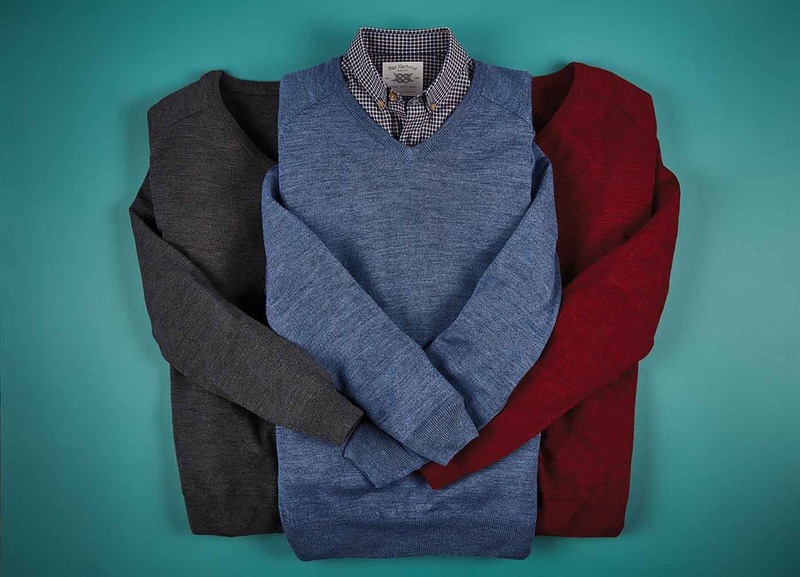 Worn over a shirt, a classic v neck sweater adds warmth, comfort and style in the office. Whilst worn on its own or over a polo, the v neck sweater adds sophisticated smartness to a casual look. Some prefer sleeveless knitwear as it fits much more neatly under a blazer. While for others, sleeves are a must. In both cases a selection of fine merino knitwear is a failsafe investment. We offer both v neck sweaters and sleeveless alternatives in a selection of colours designed to complement the most stylishly dressed gentleman’s wardrobe. For the weekend adventurer a trusty hoodie is a must. 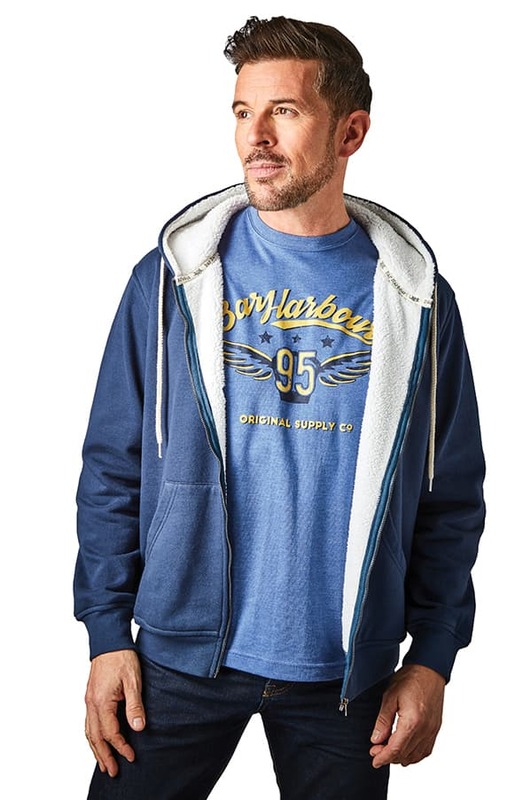 Our men’s hoodies are crafted from the finest poly-cotton blends. Designed for warmth and comfort these hoodies are made to last. New for this season we also have some luxurious fleece lined hoodies, perfect for those long brisk countryside walks!